The Ministry of Information & Communications is pleased to present the 10th edition of the Annual Info-Comm and Transport Statistical Bulletin 2019. The Annual Info-Comm and Transport Statistical Bulletin is aimed at disseminating up-to date and correct information and statistical data on ICT, Media, Transport and postal services in the country. The statistical bulletin provides data until December 2018, and therefore, valid as of that period. Attempt has been made to provide detailed statistical information keeping most parameters into account; however, there are many areas that still lack information. 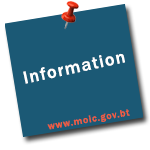 MoIC will continue its endeavor to improve and include missing information in subsequent publications.